AV Manager is a Multimedia Digital Signage software system which can operate multiple display units (LED/LCD displays, VGA projectors and video walls) remotely across a LAN, WAN or internet. It can control multiple display units located in different parts of the building or across the city from your desktop PC. With AV Manager, VCR, VCD players and CD-ROM are no longer required to connect to each display unit to broadcast advertising contents. ...... With AV Manager, VCR, VCD players and CD-ROM are no longer required to connect to each display unit to broadcast advertising contents. AV Manager supports various types of contents, such as MPEG-1, MPEG-2, VOB, FLV, AVI, WMV, ASF, QuickTime, TV channel, cable TV, web cam, text, BMP, GIF, JPEG image, and RSS on-line information, etc. AV Manager supports all these contents running on plasma TVs, LCD displays, LED signs, video walls, VGA monitors and projectors.It can be applied at shopping malls, departments, retail shops, club houses, transportations, bar & restaurants, banks, cinemas and showcases, schools & universities, airports and train stations, etc. 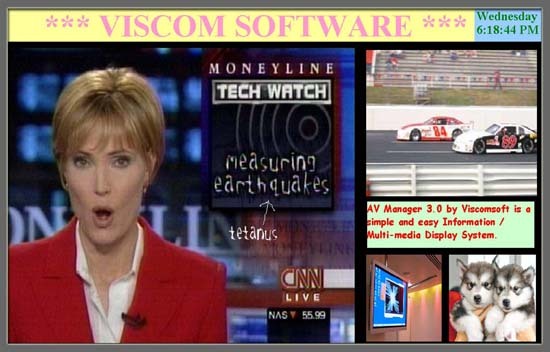 AV Manager 3.0 by Viscomsoft is a Information / Multi-media Display System. Managing the Windows My Favorite folder. Qweas is providing links to AV Manager Digital Signage Network 6.0 as a courtesy, and makes no representations regarding AV Manager Digital Signage Network or any other applications or any information related thereto. Any questions, complaints or claims regarding this application AV Manager Digital Signage Network 6.0 must be directed to the appropriate software vendor. You may click the publisher link of AV Manager Digital Signage Network on the top of this page to get more details about the vendor.